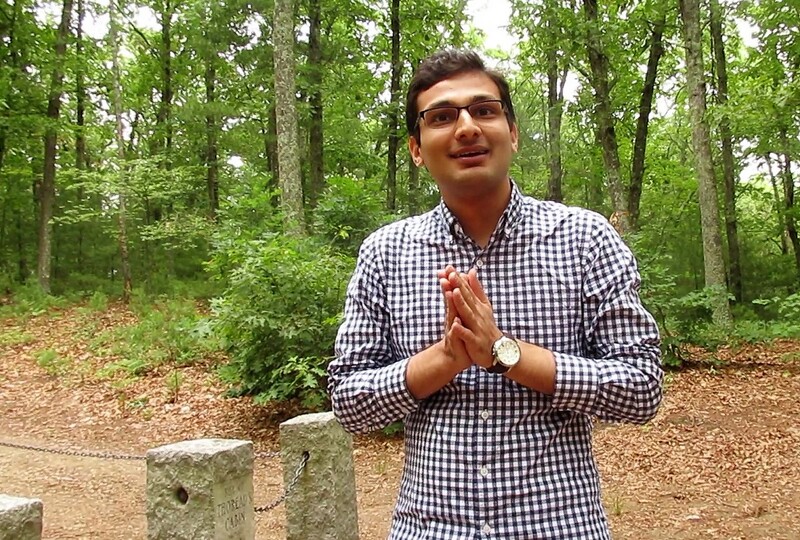 For the past 16 months, I’ve been video-interviewing visitors to Walden Pond. Approaching random strangers at the pond requires going out of my comfort zone. Normally I photograph nature at the pond and post my photos on Facebook — on my own page, on the Thoreau Society group page, on other Concord-related pages — and print them on greeting cards. And, with the encouragement of some Thoreauvian friends, I created a Facebook blog called “Walden Pond People” and turned my camera toward people, talking with them about why they were visiting the pond. Come summer of 2016 and the Annual Gathering of the Thoreau Society (AG16), I invited attendees to meet me at Walden Pond, Monday morning after the Gathering, to be interviewed at Thoreau’s Cove. I chose this rendezvous point since it’s easy to find, and it’s quieter near the western end of the pond. 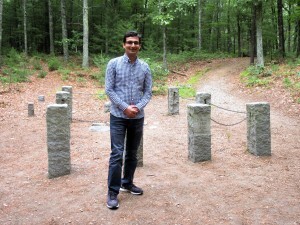 Meanwhile, thanks to my Walden Pond photos on the Thoreau Society Facebook group, I had befriended Punit, a man from India, who had been in the U.S. for less than two years and was starting to explore the country. 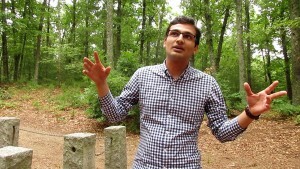 “Walden Pond is one of my dream places to visit,” Punit told me last April. In July, Punit traveled to New England to attend AG16. He had never been to Boston, Concord, or Walden Pond and attended AG presentations over the weekend, including mine on “Walden Pond People.” He waited to make his pilgrimage to the pond for when we met at Thoreau’s Cove for his “Walden Pond People” interview. 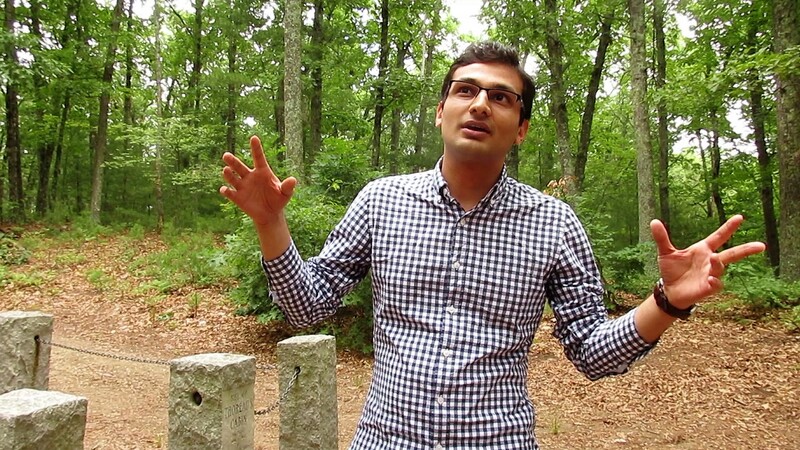 When Punit described his path toward Thoreau, he reminded me of my own experience. I, too, had bought a copy of Walden, put it on the shelf, and proceeded to not read it. I simply continued going to Walden Pond to swim, kayak and read and write, as I’d already been doing for a couple of decades. As Punit, I was influenced by others finally to take my book off the shelf. In my case it was a bunch of Thoreauvians presenting at AG11, which I had spontaneously attended. There at the Masonic Temple in Concord I was surrounded by people who knew Walden and had plenty to say about it. I was intrigued enough finally to read Walden for my first time. I read it in small bites, chewing on Thoreau’s words, while sitting in my kayak on Walden Pond. I did this over the next six weeks, until I turned the last page on September 1, 2011. Punit: “That core philosophy is one of the reasons that Thoreau got inspired by Eastern philosophy, even though he lived so much later afterward. That’s just amazing for me! And since I’m from India, Hindu philosophy especially attracted me to Walden. I think it’s really important to figure out what you want to do in life. This is one of those books which actually helped me to figure that out. “Walden Pond is exactly what I was thinking of, how I imagined it to be: a simple place, just trees, pond, that’s it. It’s very peaceful, very nice, very green. Just the kind of place you want to be in when you want to think about the higher purpose of life, bigger things in life. Well, the cabin actually looks smaller than what I thought, so I’m wondering how Thoreau lived in such a small cabin. I would find it difficult. . . . he was here for a grander purpose, so it probably suited his purposes here. I was impressed with Punit. 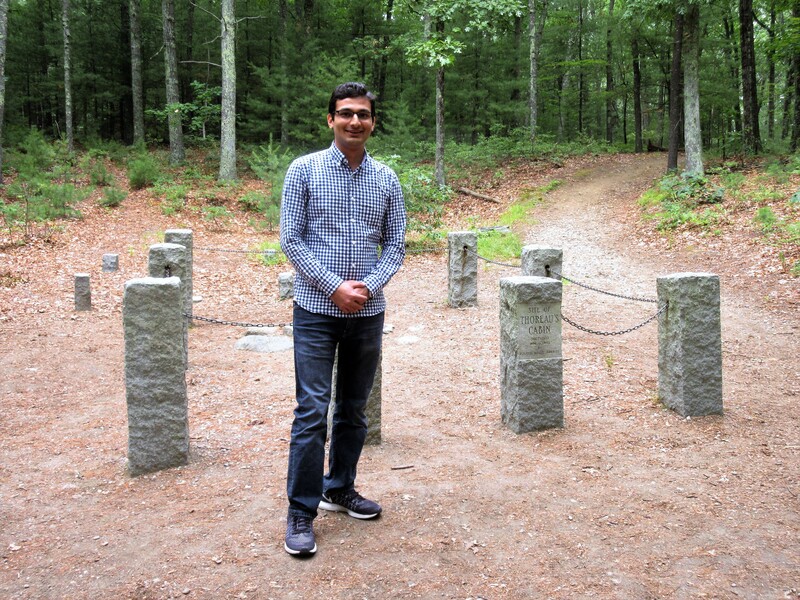 Imagine living in India, learning about Thoreau as a result of studying Gandhi — and then, eventually, actually coming here to Concord, hoping to see what Thoreau saw and feel what Thoreau felt. Punit had graciously awarded me the privilege of accompanying him on his first-ever pilgrimage to the place where Thoreau wrote Walden. I felt honored. 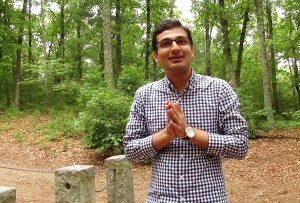 You can find my video interview with Punit here. Beautiful essay on one of the MANY pilgrims!! I’m a huge admirer of your work, the photos & stories of Walden Pond People. This is a beautifully written essay! So glad you have gotten out of your comfort zone for the project, because what you are learning from your interviews are things we all need to learn from each other!! Brava!!! Thanks for your kind remarks, Tammy, and for following my Walden Pond People blog. You’re right — there are many pilgrims. I’ve interviewed over one hundred of them so far. I hope to be posting many more over the next few weeks, so please stay tuned to Walden Pond People. Yes, we learn from each other and I *definitely* learn from the people I interview, despite feeling shy about approaching total strangers. Thanks for your encouragement.